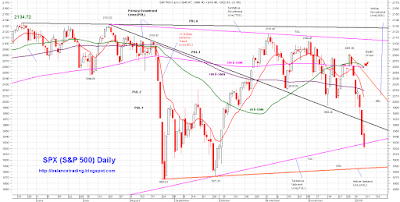 Last Tuesday SPX broke to the down side out of its symmetric triangular formation and continued to sell off for the rest of the week. On Friday, SPX penetrated and closed below its TUL while its 50 D-SMA touched its 200 D-SMA to put a "death cross" on its daily chart. 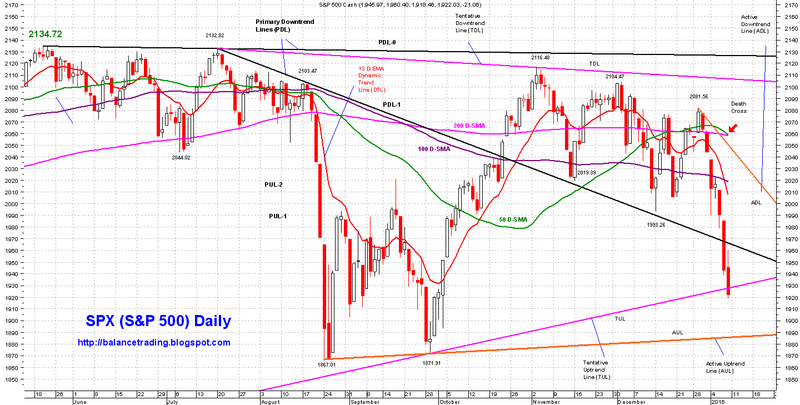 SPX chart looks extremely bearish now and it's signaling significant selling ahead in the longer term (weeks to months). Shorter term (hours to days), however, SPX is oversold, Chances are good that SPX, after possibly testing support at its AUL around 1890 on Monday, goes higher on the back of a counter trend rally to test resistance at its PDL-1 (1960) and ADL (2000) sometime later in the coming week. Last week I didn't open my third short position on SPY as planned. My plan is to open my third short position once SPX peaks (around 2000) on the back its counter trend rally. Should SPX sell off early Monday and successfully test its AUL (around 1890), I would cover both of my currently open SPY short positions. Disclaimer: The views expressed are provided for information purposes only and should not be construed in any way as investment advice or recommendation. Furthermore, the opinions expressed may change without notice.